As eviction-related suicides continue to rise in Spain, protests are becoming more frequent with the public outraged at the government’s lack of action to combat social ills. Evictions are a “humanitarian concern,” the national bank chief has said. 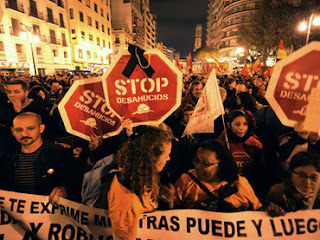 The governor of the Bank of Spain, Luis Maria Linde, said that the increasing number of evictions related to financial woes should be combated through “social initiatives.” The evictions have driven over 100 people to commit suicide, and mass protests on the issue have become a regular occurrence in Spain. “We must urgently address and social humanitarian issues, this will have to be organized, but we can do it,” Linde said, adding that the root cause of the crisis was a lack of information and reliable statistics. There have been numerous calls in Spain for a modification of mortgage law in order to mitigate evictions and stem a mounting social crisis. One particular concern is legislation that forces those evicted to continue to make mortgage payments even after they have been ejected from their former property. Spanish Prime Minister Mariano Rajoy condemned the law for allowing “inhuman situations” to transpire on a daily basis, but the government has yet to take action on the matter. Cases like Egaña’s are an increasingly common occurrence in a country where unemployment is over 25 percent, and seems likely to keep rising. At the end of October, three suicides driven by the financial downturn reportedly took place in three consecutive days. A young man threw himself off a bridge in Gran Canaria after losing his job and receiving an eviction notice, while a 53-year-old father kissed his daughter goodbye in Burjassot before jumping from his second-story flat. In the southern province of Granada, 54-year-old Jose Miguel Domingo hanged himself minutes before the bailiffs arrived to evict him from his home. The growing suicide rate across Spain has sparked mass protests and calls for the immediate reform of mortgage legislation. Since the beginning of this year, over 100 Spaniards have killed themselves over financial woes.